François Miglio was born in Montpellier, in the Languedoc region of the south of France, in early August 1958. His father was an officer in the French military and, with his family, was posted at various places in continental France and other countries of Europe. Between the ages six and ten, the family lived at Rennes in Brittany, and then moved to Brussels, Belgium where the pre-teen François discovered both Flemish and surrealist. His family then was posted to the Rhone Valley near Valence where François began the formal study of agriculture, and where he immersed himself in the natural world by cycling alone in the French Alps and the Ardèche region. During this experience, Francois discovered Le Palais Idéal Du Facteur Cheval, The Ideal Palace of the Postman Cheval, which he considers one of the best examples of “Art Brut,” as described by Dubuffet, and to which he returned many times for inspiration. In 1976, at the age of 18, François’s father accepted a new military posting at Sandhurst, the British Military Academy, where he was appointed as a professor. It was there, during visits with his family on holidays and over the summers, that François developed a “political and social consciousness” while working as a laborer on the major land estate of an aristocrat and member of the British Parliament. After he completes his high school studies in agriculture, and he reluctantly serves eight months in the French military. Then, François undertook business studies, and worked at a pharmaceutical laboratory for eight years. He married at the age of 24, and is the father of two children, daughter Laurence and son Hadrien. In 1990, at the age of 32, François decided to devote his full energies to the pursuit of art and to the restoration of an historic 18th century house he had purchased in the city of Beziers, along the Canal du Midi, southwest of Montpellier. During 1990 and 1993, he achieved Cosmogony, his first master peace which lead at the elaboration of the manifesto of his pictorial concept: «The Fractal Syncretism». 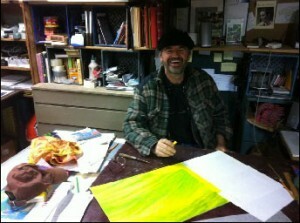 In 1998 Francois made his first visit to the United States to pursue his artistic vision in the San Francisco Bay Area. He felt, intuitively, that the Bay Area, as a vast “open system,” receptive to new ideas, encouraging entrepreneurial risk-taking would be compatible place for him to practice and evolve as an artist. While he continues to reside in and upgrade his home in Beziers, François spends at least five months of each year (during 12 years) painting and exhibiting his work in the San Francisco Bay Area. He has participated in two solo exhibitions and lecture (about «the Fractal Syncretism») at the International House of the University of California, Berkeley. And two years solo continuing exhibition at the Department of Economics at the same University (2002 – 2003). Francois Miglio has exhibited also at Stanford Art Spaces, Center for Integrated Systems, Stanford University (2006). And he did two major lectures, in Sonoma State University (2006) and in Science University of Paul Sabatier in Toulouse (2011). Miglio has also participated in solo and group exhibitions in Vorpal Gallery, in Zen Center and in New College in San Francisco and in Mc Carthy gallery in Santa Fe in New Mexico. During few years, he also exhibited with Artship foundation in Oakland and in SomArts Cultural Center. Futhermore, he has participated to the Biennale of San Francisco with Border Zone Art Foundation, at the Art Fair of Artenimes in France and in a Sony Tower Salon in Osaka in Japan. In 2011, he participated at the Art Fair of Beijing and exhibited at the gallery Li Xinhui of Nova Art Coordinates of Beijing. Currently, Francois Miglio is full time present in the West Coast in USA where he promotes his pictorial concept of Fractal Syncretism. And in 2011, MiglioArt was created in order to represent and to spread the artistic proposal of François Miglio.